We run the Skills Workshops when we get demand – and there’re always people wanting one! So email us and tell us you’re keen. Places are strictly limited – we run small class sizes so there’s more personal trainer attention for you. Two easy steps: and email + cost deposited = your place reserved. 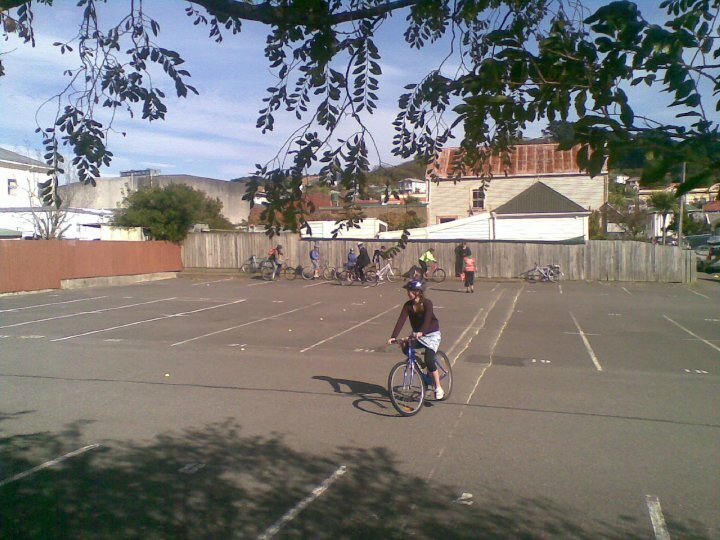 What are Street Skills Workshops? 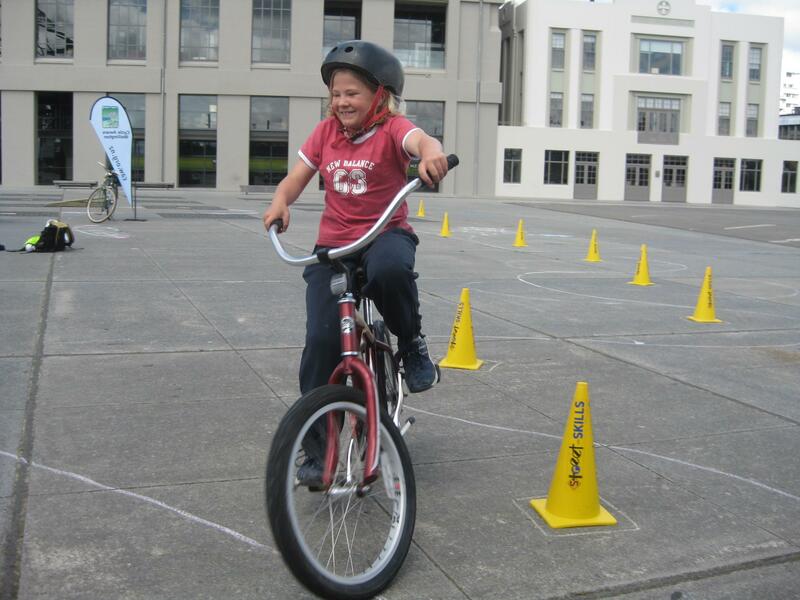 Frocks On Bikes runs special tailor-made Street Skills workshops just for Wellington’s Frockers (and a couple of dapper gents). 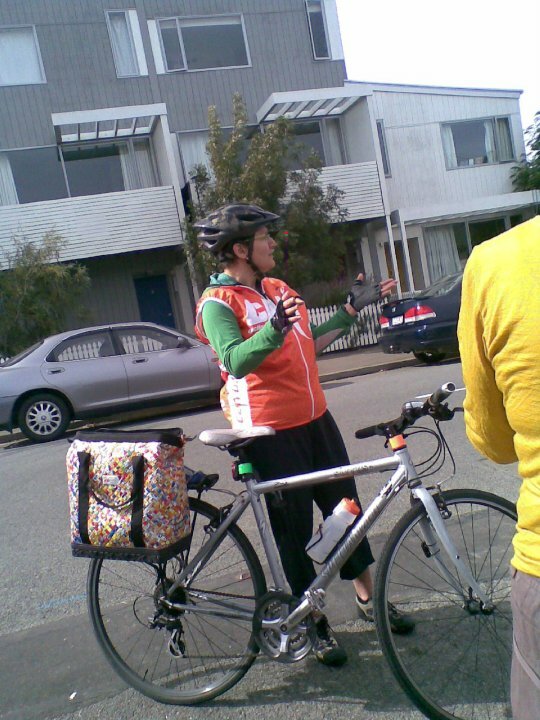 We engage expert cycle skills trainers – such as Marilyn Northcotte and Pete Reynolds – and they tailor their customary full-day workshops to a special Frocker-specific session. In a few sunlit hours, our experts take Wellington Frockers through everything from those helpful basics (that no-one ever tells you) to emergency stopping, handling tricky corners and what to do when things get rough. We start with a good run-down on road code and rights, including minor details like wearing helmets so they protect your head, using brakes, and the useful reminder that we on bikes are vehicles! All tee’d up and ready to mount, we hit the tarmac for two parallel courses in bike-handling. Frockers go through a tricky cornering session – a 101 in bike physics – a micro-version of the teaching for professional mountain bikers. There are wobbles galore, peals of laughter, a few curses and -once – a little spill, handled with aplomb by the fabulous Frocker who adjusted her sunglasses and remounted in a heartbeat. Cones standing in for wing-mirrors, motorbikes and jaywalking pedestrians. “Look where you’re going and you’ll go where you’re looking” – the new mantra of the Street Skill’d Frockers! Meanwhile, Marilyn teaches the essential skills of shoulder-checking, one-handed riding (great for indicating as well as fixing accessories on the fly) and weaving in and out of … well, any of the plethora of things you gotta weave for in when navigating the urban jungle. Marilyn's speech bubble reads "How many fingers am I holding up?" We practice both the long “OK, what’s going on around me?” look that sets you up for any manoeuvre – be it slowing down or taking up your space in the lane – as well as the quick last-minute “Life-Saver” glance (just in case there are idiots on the road). For the final hour we take our new-found skills into the wild: the relatively quiet – but still lively – streets. We practice starting and finishing a ride, some funky intersection action and traffic navigation – all deploying the skills we’ve learned in the previous two hours. 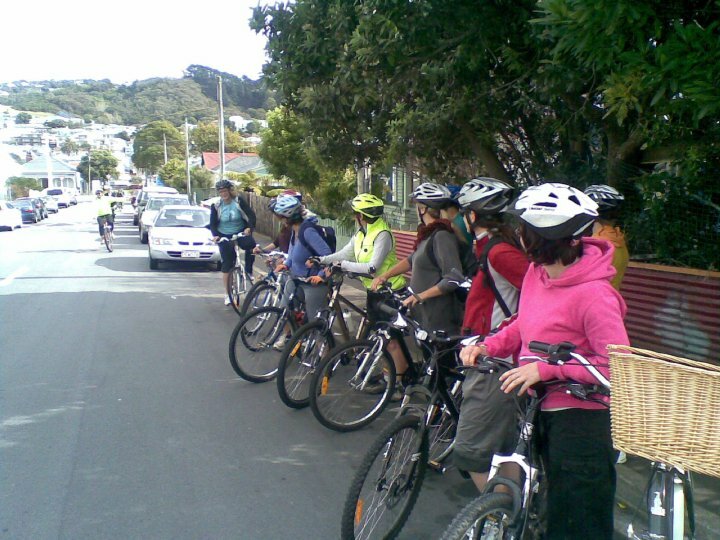 After it was all over, we repair to local cafes for a well-earned lunch – and some Frockers even eschew their planned lifts home and choose to cycle! Bravo! 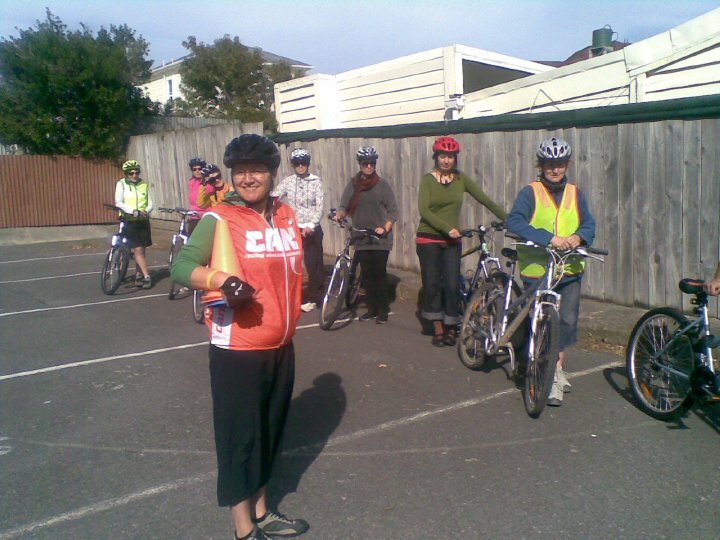 As time goes on, Wellingtonians will be privileged to see fabulous women more confident on their bikes – having more fun riding in the city! 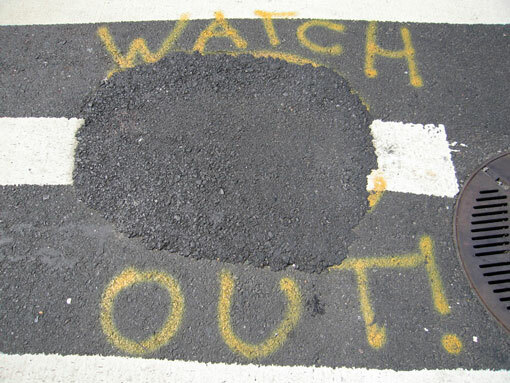 Judging by some of the feedback we receive afterwards, our promises to make Frockers “approximately a bajillion times more confident on Wellington’s […] exciting and dynamic roads” may not have been as outrageous as we thought! If you missed out this time, fear not! We’re running them right through Spring, Summer and Autumn, scheduled for demand, so email us if you are keen! Frocks is going to work with Marilyn and Pete to write a round-up of things to jog our memories from the workshop – and we’ll publish it here on the site. Everlasting thanks to Pete and Marilyn for doing so much for the love of it – and contact them directly if you are interested in their full courses. 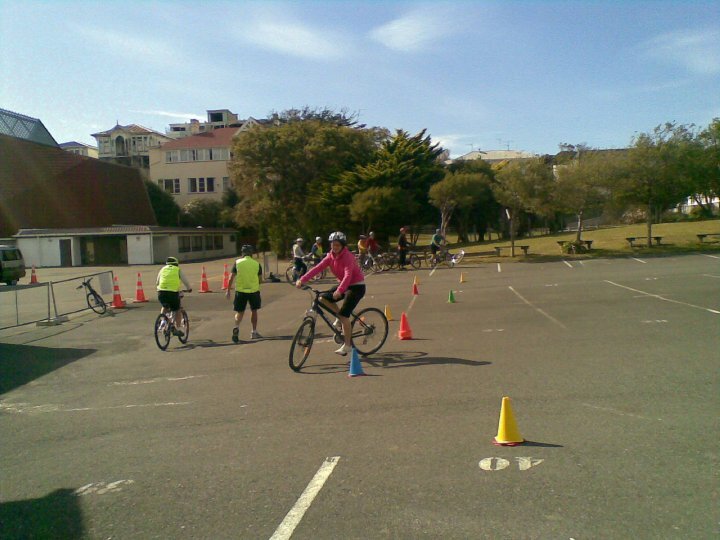 The lovely Christina from CAW organised the great Obcycle Course for Wellington’s cyclists to test and refine their bike-handling skills.